Riverain is a French term meaning “near the river,” so it’s no surprise that Newport Beach residents Dean and Laurie Gray chose Riverain as the name of their winery. 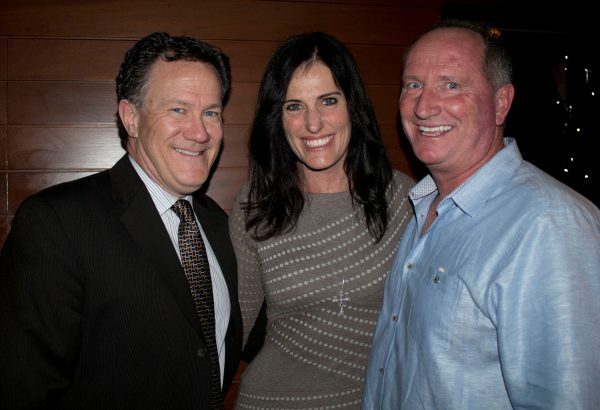 Riverain owners Steve Nordhoff, Laurie and Dean Gray. After many years of visiting the Napa Valley and enjoying boutique wines, the Grays – along with their friend Steve Nordhoff, a Laguna Beach resident who has a law office on the Balboa Peninsula – decided to take the plunge and start their own wine label. “Steve is a total foodie, and he should be a master sommelier—he’s taken us to some amazing restaurants,” said Dean during an interview at his Bayshore home. “In 2009, we made the decision to start making wine. Steve wanted to do a syrah, and I had started to really like syrah.” In 2010, the Grays purchased property in Rutherford near the Napa River, and hired Thomas Rivers Brown as their winemaker. The labels feature photos taken in the Napa Valley by Laurie Gray. They decided to make two wines: Cabernet and Syrah. The decision has paid off. After only three vintages, their wines are gaining notoriety. Noted wine writer Robert Parker gave the 2012 Riverain Cabernet Sauvignon a 95-point rating, and the 2012 Syrah a 94 rating—the highest rated Syrah that he scored last year. But don’t run out to your local store looking for Riverain wines. They are in limited supply, available at Hi-Times Wine Cellars, The Wine Gallery, Rolf’s, and a handful of local restaurants including Montage Laguna Beach, Broadway by Amar Santana, Monarch Beach Resort, The Winery, Quiet Woman, Balboa Bay Club, Vaca, and a few other select locations. “The Montage jumped all over our wines three years ago,” said Dean. “You can buy the syrah by the glass in the lobby bar, and they sell the cab by the glass for $50.” They also sell both varietals by the bottle. The Grays would love to expand production, and in fact plan to increase their cabernet bottling from 350 to 600 cases (the syrah will stay at 150 cases). Two challenges they have: no tasting room, and no employees. “After five years and three vintages, we’re not making money. Hopefully this year we’ll break even, but we’re having fun,” said Dean. Dean plans to retire from his full time marketing job in the next several years to focus full time on Riverain, including expanding it to other states (although it is available in some restaurants in New York and Florida). One indication that Riverain is on the right track came courtesy of a recent wine dinner at 3-Thirty-3 Restaurant with their friend, winemaker David Arthur. Dean recently solved his tasting room dilemma: Thomas Brown is opening a tasting room in Napa Valley, and Riverain will be able to do private tastings there. For more information, visit RiverainVineyards.com.